Rely on the professionals at Affordable Moving Services for a seamless, stress-free move. We do it all, from full-service commercial and residential moves to just loading up your truck or packing your belongings. Make the right move hiring our small family owned business, bringing you more than a decade of experience. Our trained movers consistently work hard day after day to handle all the details. So, when you need to move your home or office, get in touch with the best movers in West Bloomfield. Not only will we wrap and pad your valuables, couches, appliances and more, we also give you options like carpet shields at a minimal extra cost. Serving the Metro Detroit area for more than a decade, Affordable Moving Services LLC is your go-to provider of all kinds of moves, whether you’re buying your first house, upsizing, downsizing or uprooting your office from one end of town to the other. We enjoy working in West Bloomfield Township, nestled in Oakland County within the Detroit metro area. It may be one of the most expensive places to live in the area, but it’s also one of the most coveted, comfortable and convenient as well, home to 66,000. As a BBB Accredited Business, you can rest assured we give you quality services at great rates. To start planning, get in touch with us for a free quote on services of all kinds, from residential moves to commercial relocations. 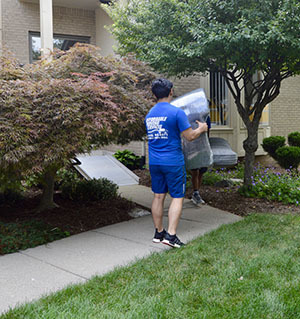 Here at Affordable Moving Services, you’re taking a step in the right direction when you hire us to handle your next move in West Bloomfield. We will take care of the logistics while you concentrate on more important things. Don’t have time to pack? Let our trained experts pack up all your stuff using quality packing and shipping materials. Our first priority is keeping your belongings safe from start to finish. When you hire us to get the job done, you get assurances of professionally trained movers who are more than qualified to pack and move your belongings. Not only are they friendly and accommodating, they go to great lengths to care for your furniture, electronics, and other belongings to ensure safe transport at all stages. Our local company brings a decade of experience to every move we handle, giving you a cost-effective solution that works every time. Our headquarters is located in Rochester Hills, but we happily serve all of West Bloomfield. For more information on our services in West Bloomfield, please contact us today at (248) 260-7026 or email us at affordablemovingservices@hotmail.com.